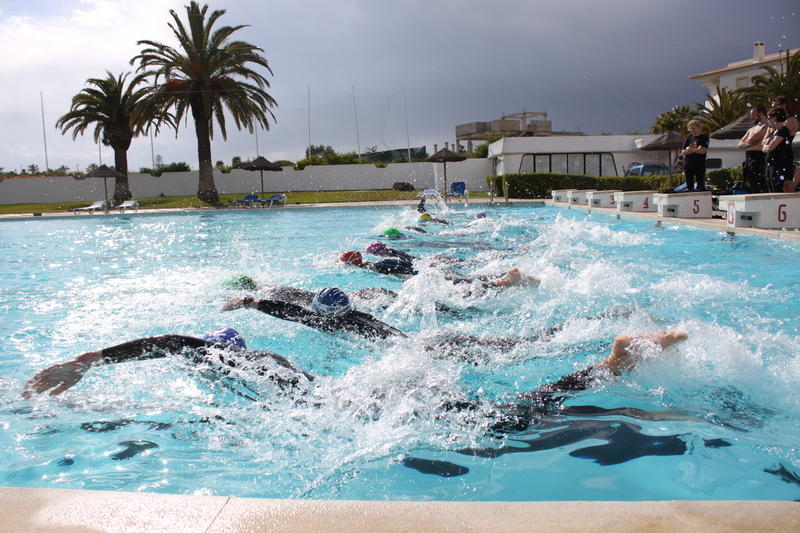 Reserve your place on this March Triathlon Holiday. 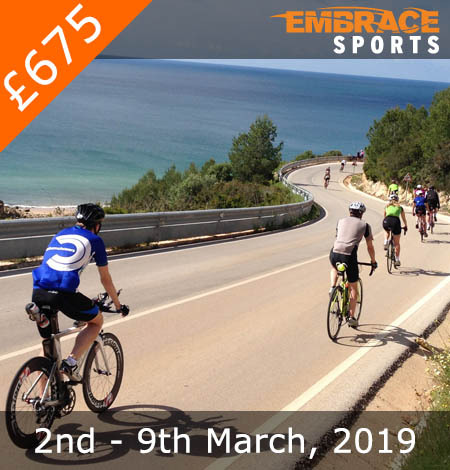 March is a great time to ramp up your pre-season training in the Algarve. While temperatures are near freezing elsewhere, the Algarve casts sunshine’s between 16°c – 18°c (61°f – 65°f) across our beautiful training grounds. Come and experience excellent training, coaching, food, accommodation excursions and of course great company with other triathletes. First time on a tri camp is done! Only word for it is “amazing”! Great running, cycling & swimming! Coaches have great knowledge & are always approachable for tips or ways to improve! Looking at booking my next camp should say all you really need to know! Just finished a fantastic week of good quality training with Embrace. They offer a friendly and supportive environment where you can push yourself to do more than you think. The quality of food is amazing and you get to meet lovely, like-minded people. Fully recommend it. Do it!!! My first training holiday and it didn’t disappoint . Lagos is great location, with some good tough terrain for training. Coaches were great and created a good environment for you to push yourself. That’s not to mention the food, which was phenomenal. Again a perfect training holiday with good improvement as a result. Thanks for the training sessions, good food and good company. Location was great, facilities excellent, some hard training and ridiculously good food! Would absolutely recommend. Massive thanks to the coaches for their expertise and flexibility in rearranging sessions on the fly to get the best out of the week. Second time on this camp and just as good as the first. It was a smaller group this time but this allowed for more individual time from the coaches which was great and really appreciated. Really great group of fellow triathletes who pushed each other on to greater things. Food better than ever, just a great week of training. What a week! Achieved a lot more than I thought was possible. Great open water swimming, cross-country running and road biking. Coaches were excellent – always there when you had a question or giving tips on how to improve performance. Superb location, food and fellow triathletes. Highly recommended. A great week and exceptional value. Lots of training and lots of (important) rest. You can push yourself as hard as you want, which is great as it caters for all abilities. The setting is spot on, accommodation has all you need, bike routes good and generally quiet roads, some demanding runs and some excellent sea swimming. The food is worth a special mention, the coaches cook and they do an amazing job – always more than enough food and really good quality. The guys really go out of their way to look after you and make sure you’re enjoying it while pushing you to consider how far you can stretch yourself. Thanks for a great trip and hope to do another one in the future. Another great week of riding on good roads with great company from people I’ve never met before. The accommodation and food is superb and the whole trip is a good mix of training in the day and enjoying the food and drink in the evening. 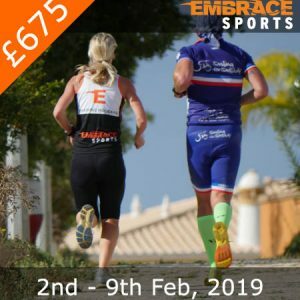 Having been on two running holidays previously, this was my first Triathlon week with Embrace and it didn’t disappoint. The location and accommodation was absolutely perfect, coupled with a great bunch of like minded people, fabulous food and the support, knowledge and encouragement of the coaches made for a fun training week. 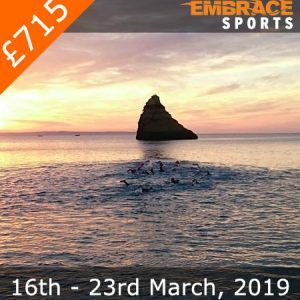 A blend of challenging sea / pool swimming, running and cycling in beautiful locations, added to some relaxation time before an end of week challenge provided the perfect holiday experience. Thank you Neil, Graeme & Chris for another epic week, already looking forward to Embrace Trip number 4. This was my first embrace trip, but it will definitely not be my last. Great location, great facilities, great training, and the food was immense! Such lovely, engaging people too – both the staff and the other guests. Loved it! Great week which has improved my fitness, understanding, technique and confidence in all disciplines! Lovely group of people and spot on organisation. Thanks All. I have been on this training holiday for the previous two years and am attending the long distance camp this year. The first year I attended alone and was a bit apprehensive about this, but the coaches are great and all other members of the group are like minded and friendly. I would have no problem recommending Embrace to anyone ! I was fortunate enough to attend this training camp a few years ago. It was AWESOME! I was able to spend a full week focused on me and my training needs. The coaches are great and very knowledgeable. The food was unbelievable! I decided to kickstart my IM training with this triathlon holiday. It was a great way to get more into it!!! Everything is top notch, from the premises to the coaches (the food deserves a separate chapter ), to the rest of the group. I would totally go back and I highly recommend it! Fed up of the endless cold and wet winter? Then get yourself to the Lagos sun for a great week of top training, amazing food and banter. You get out what you put in but so much more from people who clearly love what they do. Any time you get to swim in the ocean in March has got to be savoured right? Great, location, facilities, catering and Coaches. This was my 2nd and I will definitely be returning again. The week is really well put together. Great value for money and very well organised. Fantastic coaches that do everything to ensure a great week is had by all. Another Embrace holiday which didn’t disappoint! Brilliantly organised, great training and lovely accommodation. Highly recommended. Yes the triathlon training schedule was pretty full on but the Embrace guys were brilliant and every day was fun/ varied and hugely rewarding. The location/accommodation/ complex surpassed expectations and the food was awesome and always available (I am a huge foody so this gets a massive tick!). All in all I had a great week and would highly recommend it to anyone who is up for a challenge and some fun! Excellent trip, look back at the week and cannot believe how much the Embrace guys fit into the week. Had an incredible time and achieved many personal bests. Cannot recommend this holiday strongly enough; exceptional value for money. A friend was fortunate enough to win this holiday, when she couldn’t attend i’m sure many operators would have said ‘tough’ – instead Embrace allowed her to transfer the prize to me. I had a great time, coaches were all top notch in every regard, food excellent. A week of excellent training with top people, happy to recommend. Good luck guys.